To view our Community Frame focused on physical availability, click on the frame image on the right-hand side of this page. Communities that address the days and hours that alcohol can be sold, limit the retail availability of where and what types of alcohol can be sold, and enforce the legal drinking age are doing the right things for youth and families. When alcohol is too readily available the negative effects pile up, including making access to alcohol easier by youth and, therefore, increasing underage drinking and the related consequences. 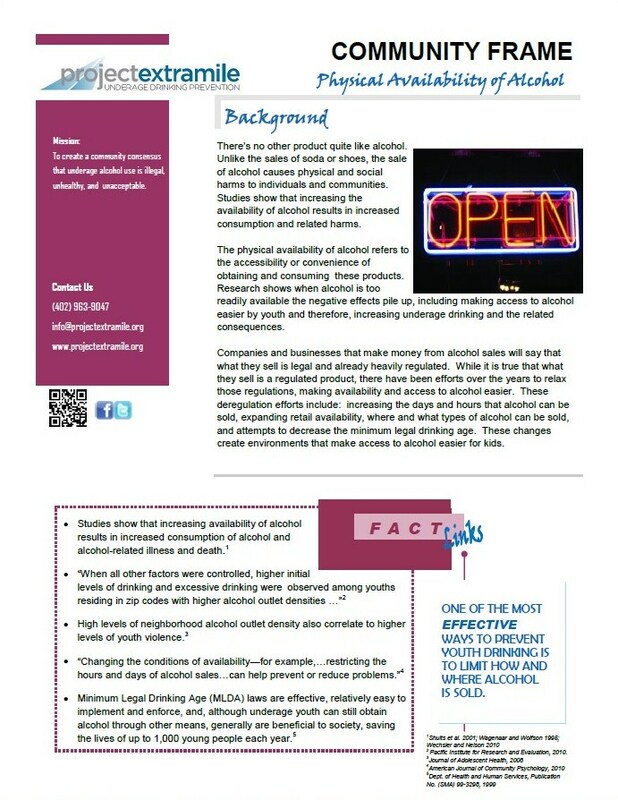 The Physical Availability Community Frame and supporting materials on this website provide facts and figures that will help inform planning board members, city council members and other elected officials on policies regarding limits on the sale of alcohol. The Physical Availability Community Frame and supporting materials on this website are based on the latest science and research.